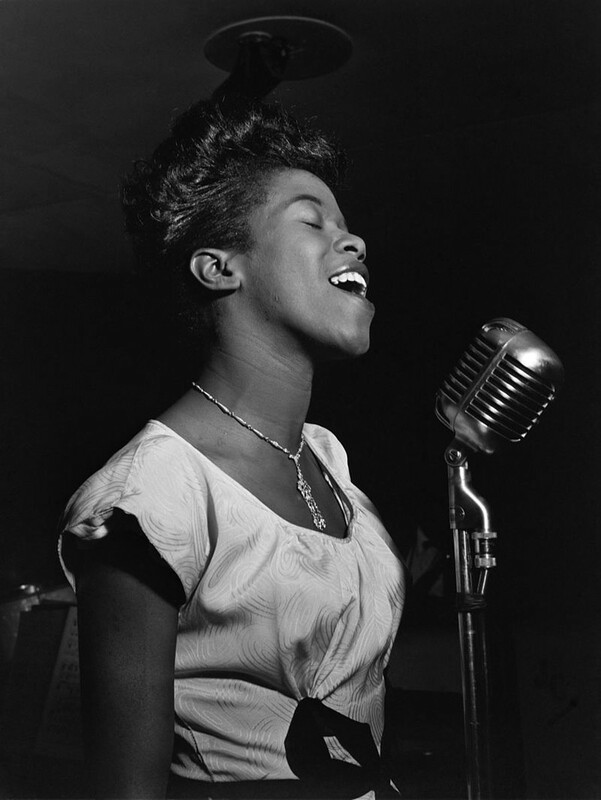 Jazz singer Sarah Vaughan at New York City's Café Society in 1946. Sassy is coming to Symphony Center. This Friday, the home of the Chicago Symphony Orchestra will be the setting for a tribute concert to the great American jazz singer Sarah “Sassy” Vaughan. The Chicago Jazz Orchestra (CJO), led by artistic director and founder Jeffrey Lindberg, is collaborating with prominent Chicago jazz vocalists Dee Alexander, Ann Hampton Callaway, and René Marie to pay homage to this jazz tour de force. Lindberg, who is well known for his transcriptions of original jazz recordings, has had his arrangements performed by such greats as Gunther Schuller, Clark Terry, and Joe Williams. The Smithsonian Jazz Masterworks Orchestra also performed two of his transcriptions at the White House. Nor is he a stranger to Vaughan’s work: he explained that when the idea for the concert first surfaced, he’d already completed about a dozen arrangements of her works. So it would seem that there is no ensemble better equipped to cover Vaughan’s extensive discography. For this concert, the CJO will be joined by a 41-piece orchestra, “which will allow us to do just about everything she recorded,” Lindberg said. “When we do a tribute concert to anyone, whether it’s a singer or instrumentalist, we’re going to at least in part use arrangements that were performed by these great artists,” he said. In the past, the CJO has done tribute concerts to Benny Goodman, Ray Charles, and Charles Mingus, among others. “If you think of Ella Fitzgerald, Frank Sinatra, Sarah Vaughan, you think of not only their great voices, but also the arrangements that they sang,” Lindberg said. Friday’s concert will be in keeping with that tradition, and will feature selections from Vaughan’s vast repertoire, which have been recorded on over three dozen albums. Critics have marveled at how powerful her immense, three-octave vocal range remained, even as she grew older. She gave performances until she was diagnosed with lung cancer at age 66. In addition to the technical versatility three singers offers, Lindberg also commented on how this performance model is a riff on the Three Tenors, the popular operatic singing group comprised of Plácido Domingo, José Carreras, and Luciano Pavarotti. Yet as with any tribute concert, the artists will have a certain level of autonomy, using their own artistic inclinations to best honor Vaughan. “It won’t sound like Dee [Alexander] trying to imitate Sarah Vaughan, it will sound like Dee phrasing and paying homage to Sarah Vaughan,” Lindberg said.